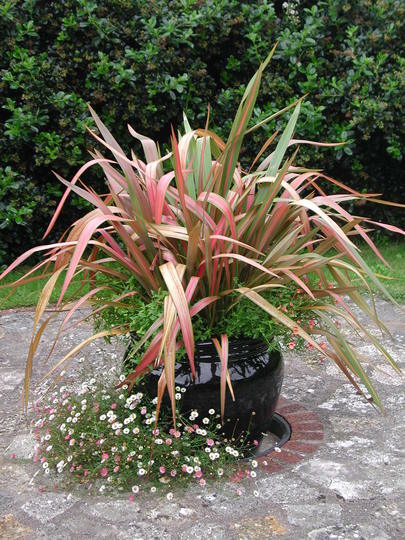 Well, in the centre of my back garden is a stone circle, which cried out for a central feature – I found a lovely black shiny pot and planted a Phormium in it. I added hardy orange Diascia which looked good. The Erigeron karvinskianum added themselves! This was 13 years ago when we moved into our new home. 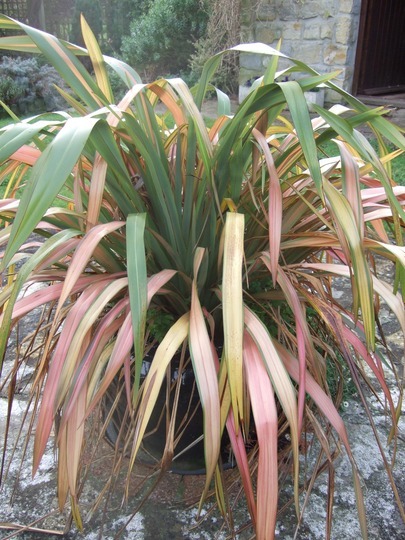 Just lately, the leaves on the Phormium started to look tatty and yellow-ish rather than that pretty pink. I fed it, coaxed it, all to no avail. So I made the decision – it had to go! Oh, but how? Firstly I chopped all the leaves off close to the pot rim…so that was where all the snails lived! Then my husband and I tried everything we could think of to get the rootball out of the pot. We had a wide arsenal of weapons – a hose, a sharp trowel, an old kitchen knife, an axe (yes, really!) and a lump hammer. To no avail. Eventually, several hours later and with blistered hands, we admitted defeat. One blow of the hammer and OUCH!! CRASH!! No wonder it hadn’t shifted, no wonder the poor Phormium leaves had yellowed. Have you ever seen such a pot-bound plant before? No, nor me. Well, I did warn you this was a horror story! 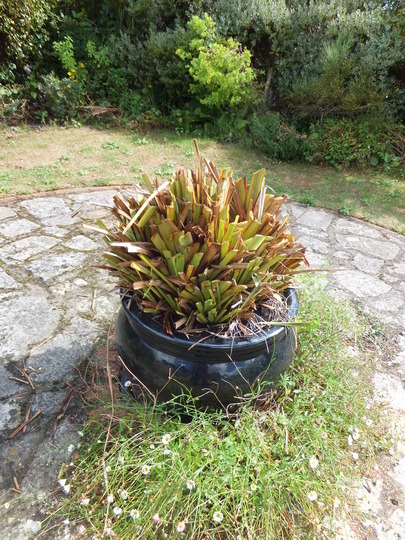 My horror story ends happily – I went on a pot hunt, found a similar one and planted it up completely differently. I smile when I see my new pot! That’s Rosa ‘Lady of Shalott’ in the centre of the pot, by the way. Such a shame you broke the pot . 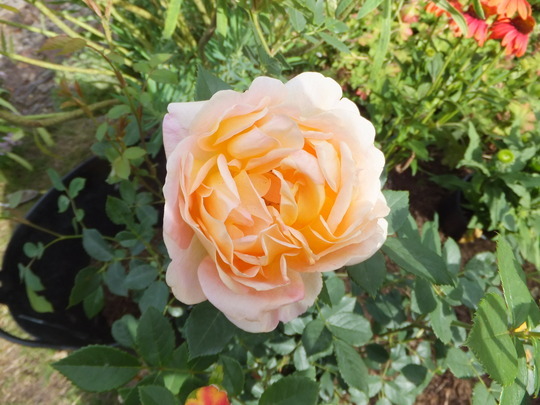 Your new Rosa ‘Lady of Shalott looks much nicer. Oh, I feel your pain, but I really like your happy ending. I've got 3 tall tom pots (think that's what they are called), that with hindsight I planted up with the wrong plants years ago. I have decided I need to remove the plants, but this is exactly what I'm worried will happen when I do. 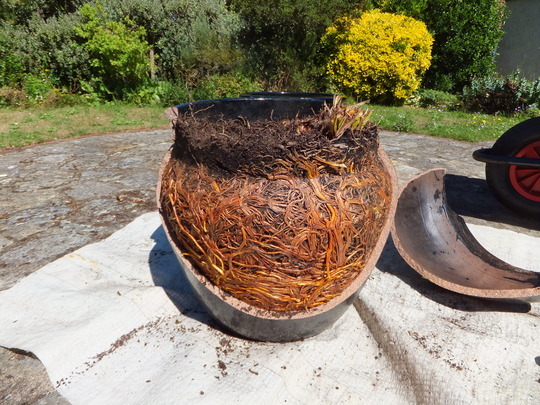 That is of course the problem with that lovely shaped pot, we all have them and if it's anything with a large rootball, your story will be the result. Didn't you feel the need, for old times sake, to keep a piece of the Phormium, it was very pretty? A hard decision Spritz, but the new pot looks great., and the rose is beautiful. Oh dear, I've done the same but only recently, planted 2 red robin either s7de of my front door and I know I'm storing up trouble. 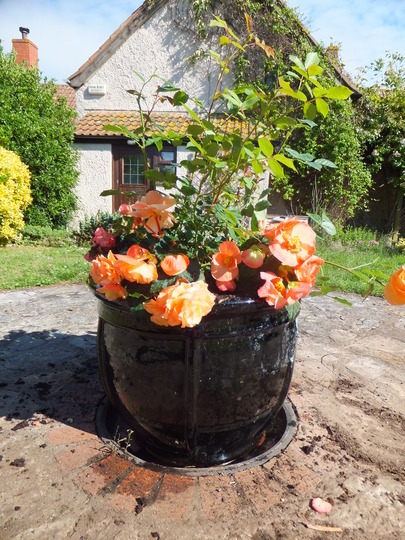 Saying all that, you have replaced it with a really nice pot and the rose looks terrific. Well the new pot certainly is an improvement on the latter days of the original plant. 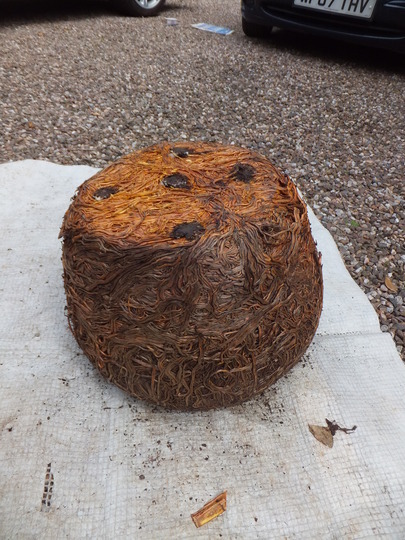 We find when we buy plants from a Garden Centre that often roots are pot-bound and we have to transplant them. Does the rose have a strong scent? Shame about that gorgeous pot, better luck with the new one.......Love Lady of Shalott. Yes, Eirlys, the rose has a lovely scent. Great story, and I have an idea maybe for those shape pots.... possibly put plants in more normal shape/straight side/easier to manage pots and then place those inside the fancy pot? I do that with my patio planters. Its great because you can have plants flowering at different seasons and just change them over when they have finished flowering.